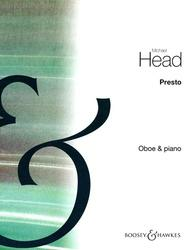 From Three Pieces for Oboe and Piano. Composed by Michael Head (1900-1976). Boosey & Hawkes Chamber Music. Contemporary, Classical. 12 pages. Boosey & Hawkes #M060032578. Published by Boosey & Hawkes (HL.48009834).